- added temporaly "Help" link. I suggested to Sergey some small modification to the architecture of the solution and he agreed on that, and modified the code accordingly. There are some small modifications to the page too. 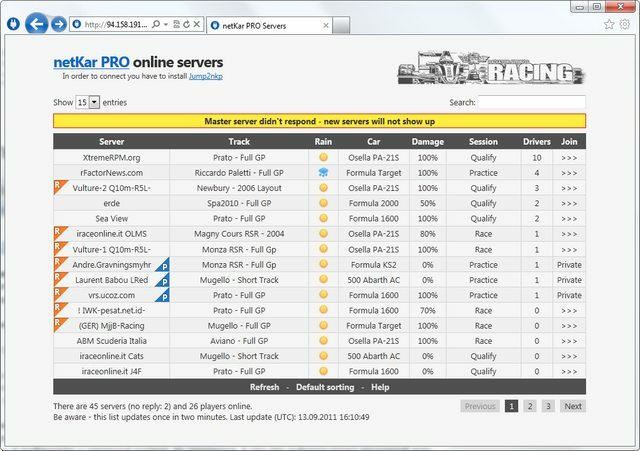 Most importantly the page can be accessed now even on a shorter link http://www.radiators-champ.com/nkpservers/ and will be in this case without RSR menu' on top. I want to thank once more Sergey for the nice work. Well done mate. Looks really cool! Andrea can u or Sergey put link for the Server GVRteam to go to gvrteam.gr pls? 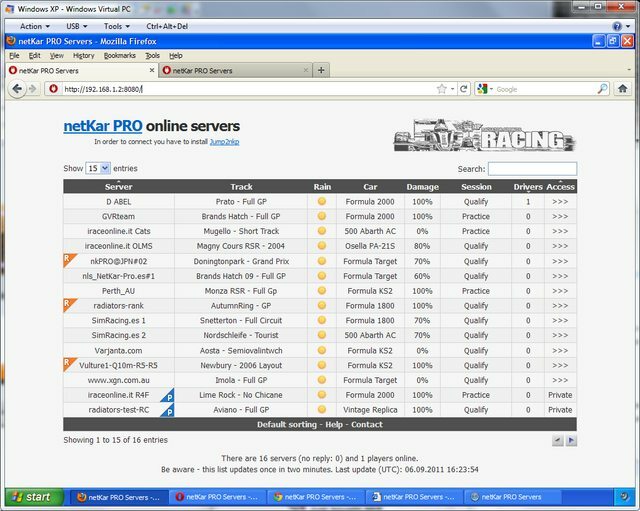 Vaggelis Theodoridis wrote: Andrea can u or Sergey put link for the Server GVRteam to go to gvrteam.gr pls? Anyway there is new version out with slightly changed desing. Now private servers have blue icon with "P" letter. A group of links was removed from bottom of page for better page reading. Added small sorting icons. "Default sorting" and "Help" buttons moved to table footer. Still no auto refresh, but I'm working on it. I was thinking about replacing car names with icons, but unfortunatly I haven't found good looking ones. The new update, just describe by Sergey, has been successfully deployed. The core of new version is almost done. Still need to do a help page and fix sorting issues. 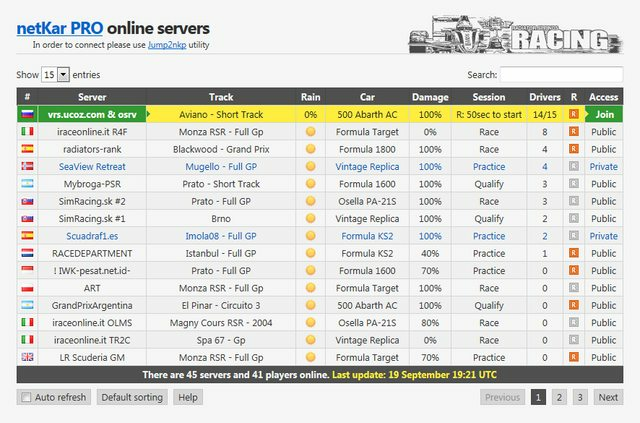 if you don't use auto refresh line "Last update:..." will change color to yellow after two minutes - that will remind you that you need refresh the page to get the actual information about servers. Also you can click on this line to reload the page. But now it went the page on the left.I use chrome and i found this problem in other pages too so maybe its chrome's problem. Edit:I saw this problem at first and i thought i pressed control+f5 to clear cache...Anyway i pressed it again and page looks fine! PS: The page was tested in all popular modern browsers - there are no problems between them. Sergey if u could put an option to hide the private server it would be great! I was thinking about that too, but had to time to implement it. Anyway by default the table is sorted in a way when all private servers are placed in the end if they are empty. i mean like in the online session of the sim, since you have all the IPs of the servers. if i do a ping in a CMD prompt to vrs.ucoz.com I get my ping to their server..
it should be a local ping to every server.. maybe it makes no sence.. but instead loading the sim and looking to the ping if it´s to high maybe a better choice is to select another one. You see, there are two modules in this project. The first one is a program which runs at RSR gaming (where NKP servers) is asking servers for info and generating the table. The second - web page which grab the table and you see the final result in browser. The program works in similiar way like netKar PRO launcher, except that it is runs not on your computer. So it can't check ping from nKP servers to your computer - only to place where it runs, i.e. 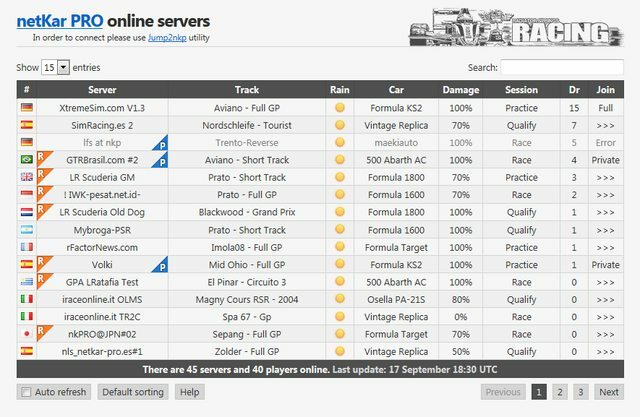 RSR gaming server. And that ping value may be completly different from that you actually have. ok, that's what i thought, but thanks for the explanation. it's a great idea, at least we can know the servers location. nice one! So guys, whay do you think about new layout? I like it a lot. A lot of useful informations over there. nice touch with the flags, will it be able to sort by country?